Mesa house photo by Rollefson. Passing through the Black Desert in northeastern Jordan, one is struck by the lifeless and forbidding character of the landscape. The rainfall in the winter is sporadic and miserly, amounting to less than 50 mm on average per annum, although there may be many years in a row when a particular locality receives none at all. Bedouin herders have managed to eke out a living with their flocks, yet the population density of people and animals is among the lowest of the habitable regions of the planet. 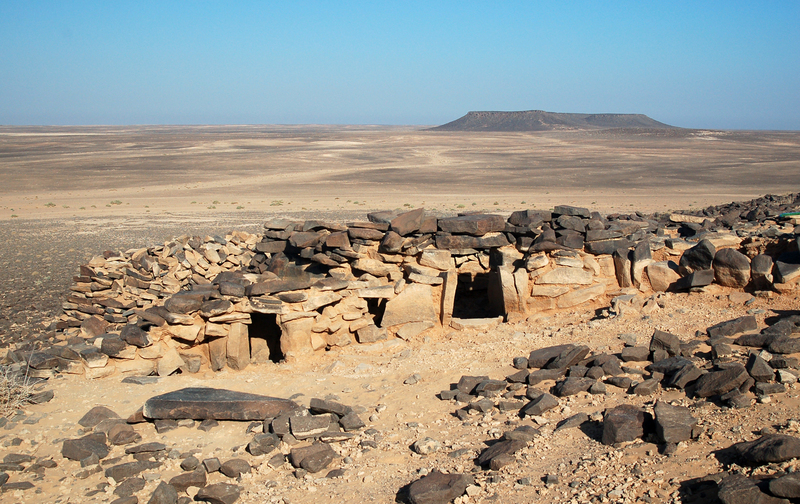 Archaeological investigations in the early and late 20th century indicated that this harsh region was inhabited for periods ranging certainly into the Neolithic and earlier periods, 7,000 to 10,000 years ago, and older. Archaeological surveys and excavations undertaken since 2008 by the Eastern Badia Archaeological Project, as well as major improvements in remote sensing by David Kennedy’s Aerial Photographic Archive for Archaeology in the Middle East (APAAME) project and Google Earth, have changed our understanding of what was considered the dismal nature of the Neolithic landscape into one that was much more inviting than what we can see today. Instead of timid migrations of a few families into the Badia, hundreds of kinship groups made the move about 7,000 BC from the damaged farmland of western Jordan into a region that, although it could not sustain agriculture, for thousands of years was probably a relatively lush grassland providing abundant pasturage for sheep and goats, even as far east as Ruwayshid. Veritable villages of families could live in permanent housing for 5 to 6 months of the year, tending their flocks and hunting teeming herds of gazelle and other animals. Charcoal from oak trees and preserved topsoil under Neolithic houses reveal that rainfall was probably considerably higher then, and that moisture penetrated the soil, providing extended growth capabilities for grasses and other plant life. Gary Rollefson is Professor of Anthropology at Whitman College in Walla Walla, Washington. He has worked on archaeology in Jordan for nearly forty years, specializing in Near Eastern prehistoric archeology, and prehistoric religions in Jordan and Saudi Arabia. He is well known for his work, together with Jordanian archaeologist Zeidan Kafafi, at the site of ‘Ain Ghazal and the discovery there of ancient plaster statues. Rollefson first came to Jordan on an ACOR fellowship in 1978. He lectures and publishes extensively. Rollefson studied Anthropology at the University of California, Berkeley BA (1965) and at the University of Arizona, MA (1972), and Ph.D. (1978).